The objective of this worksheet is to practice the comparative and superlative in a Christmas context. 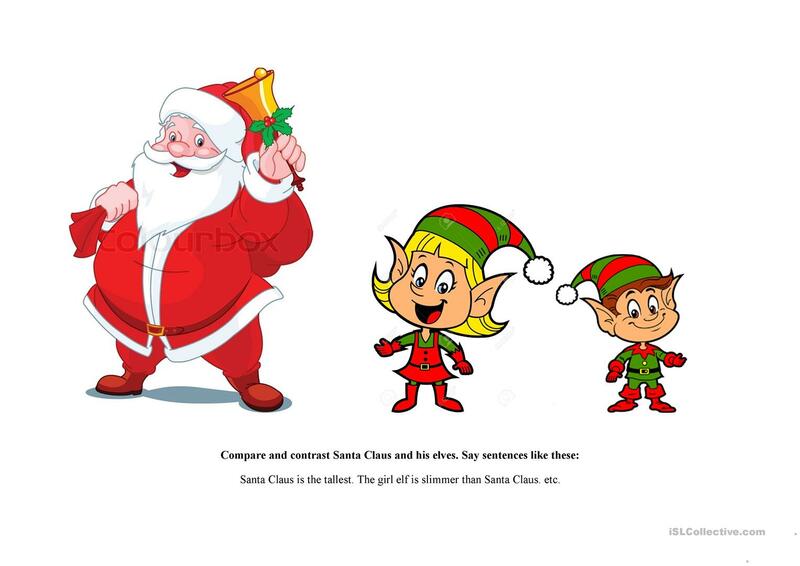 There are 3 pictures (Santa and two elves) and they have to create sentences about them using the comparative and superlative. This is a fun practice that can be made into a competition: divide your class into teams or pairs (depends on the size), give the teams a time limit and ask them to write as many comparative and superlative sentences about the pictures as they can. The team with the most gramatically correct sentences win. This printable, downloadable handout is a great resource for elementary school students at Elementary (A1) level. It is great for revising Comparison (comparative and superlative) in English, and is a valuable material for enhancing your class' Writing skills.